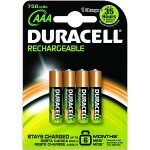 Duracell AAA 750mAH rechargeable batteries. Not only will you get hundreds of uses out of each Rechargeable battery, but they stay charged longer so you can recharge less*. These high power 750mAH AAA NiMH batteries are ideally suited for high-drain or frequently used devices such as pc mice, remote controls etc.